What comes to your mind when you think about a place where the most advanced technologies have been born? It’s an area which people from San Francisco consider as a village – but people from this “village” earn twice more than an average USA citizen. Yes, we are talking about Silicon Valley – a place in north California where the biggest tech companies, like Google or Apple, have their headquarters. The word “silicon” originally referred to a large number of silicon chip innovators and manufacturers in the region, but the area is now the home to many of the world’s largest high-tech corporations, including the headquarters of 39 businesses in the Fortune 1000 list and thousands of startup companies. According to Steve Jobs, Apple founder, people working in Silicon Valley are truly extraordinary. Where to establish a startup? 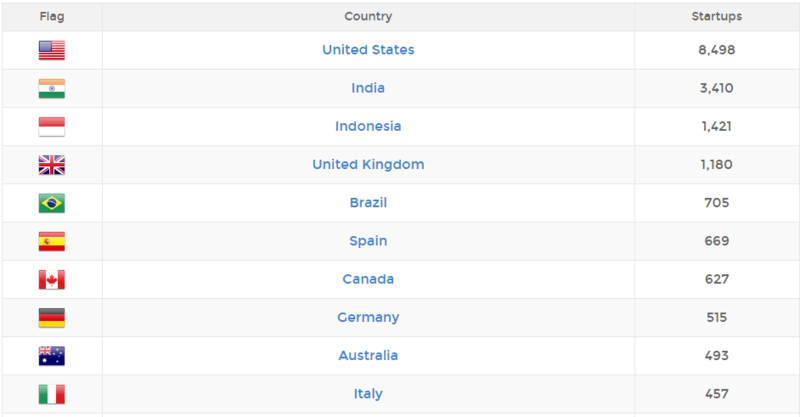 The United States at the top, and leaving others far behind, is not surprising at all, the same about India. But were you expecting to see Indonesia that high? I don’t think so. Still yes, with almost 1,500 startups founded here, it’s taking the well-deserved 3rd place. Also European countries, which make up half of the top 10, are good places for establishing your startup. You will find a lot of mobile app startup hubs and incubators there as well as enthusiastic people with excellent tech university background. Consider this when deciding where to set up your company. Which city is the best for founding a tech startup? Picking the right country is not the end of the road when it comes to choosing the best place to set up your startup. You also need to decide for a city, that will give your company the best opportunities to thrive! In which ecosystems does an early-stage startup have the best chance of building a global success? They’ve measured cities due to 5 most important factors: performance, funding, market reach, talent, and startup experience. The outcome of their research has been shown on a chart below. In comparison to previous years, we have a few unexpected changes. Yes, Silicon Valley stays at the top of the list BUT it is no longer the number one in every aspect. When it comes to talented people, Singapore is the first in this category. Also surprisingly Beijing, Shanghai, and Stockholm appeared on that list for the first time, already taking a very high position. As we hear all the time that Asian countries are on their way to becoming technological superiors, Stockholm as a great startup city is something new and definitely worth noticing! London advancing by 3 positions is also a great achievement, showing that Europe definitely has something to say when it comes to tech startups. And don’t forget about Sydney – city with the highest Growth Index right now. Unfortunately, Tel Aviv is constantly losing their once achieved high position, probably due to a decline of talented people around. Which is sad, because Israel has more tech startups and venture-capital funding per head of population than anywhere — even the United States. 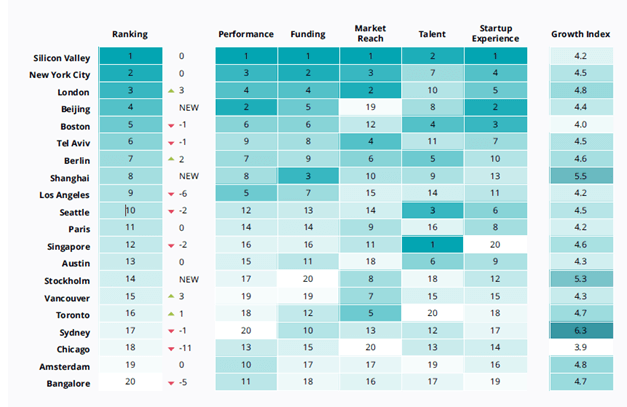 Seoul wasn’t listed on this chart, but the city authorities encourage especially mobile startups to thrive in their city. As the startup scene changes so rapidly, also countries from CEE region are making their way to the top. Especially Poland, with many tech startups located mainly in Cracow and Warsaw, is called “a country on track to becoming a major European tech startup hub” by Forbes. Cracow, a former capital of Poland, is a home to many globally known companies like Brainly (a social learning network, that reports more than 40 million unique users every month across more than 35 countries), Estimote(startup using beacons technology, which recently secured funding of $10.7 million in a round led by Javelin Venture Partners) and Codewise (company making web advertisement tools, that recently placed on 3rd position among fastest growing companies in whole EMEA region). According to recent studies by StartUp Poland, among the startups that were growing at more than 50% annually, most were doing so through the sale of mobile and big data services to large corporations. Over half (54%) of Polish startups are exporting abroad, mainly to the US and UK. Also Ready4s, as a Cracow based mobile company, owes most of its success to the excellent location we are operating in. Thanks to closeness of the best technical universities in Poland (University of Science and Technology AGH) we can hire some of the best developers in the world and cooperate with very talented startups that have also appreciated the advantages of this beautiful city. What are the main factors that you should consider while deciding where to establish your startup? Talents – if you are considering founding a mobile startup make sure, that you have THE BEST specialist right under your nose. Choose the city with the best technical university in your country and start searching for the brightest minds that will join your team. Funding – don’t kid ourselves – money is something that even the best startup can’t succeed without. Find countries and cities that encourage mobile startups and provide them with help at the beginning of their journey. This is a very smart move from their side as they know that it will definitely pay off! Startup Hub – when it comes to startups it’s not good to be just by yourself at the beginning. Closeness to other successful and experienced companies will be a great opportunity to learn from them and join meet-ups or courses organized by them. Don’t be a shark, leave it to corporations – mobile app startup hubs are much more friendly and cooperative than others, make use of it! Do you already know where to establish your startup? Check how to choose a good and reliable app developer for your project.